Lee Anne Walters with her son Garrett outside of her home in Flint. Another sample of tap water. Lee Anne Walters' twin sons Garrett and Gavin hold protest signs outside Flint City Hall. Walters won’t let her kids drink any water from her faucet. She won’t even let her four-year-old boys, Gavin and Garrett, bathe in anything but bottled water, so preparing for bath time is quite the chore. Walters takes jugs of water she buys at the store, dumps them in large pots, and heats the water on her stove. Once it boils, she dumps the water in the bathtub. Then she adds three or four gallons of cool water to sort of get the bath at the right temperature. Over several months, Walters says she’s gotten pretty efficient at this routine. She’s got bath prep down to about 45 minutes. “And then in between, because we only do the bathing thing once a week now – because, one, it’s expensive, and two, the expense of all this on top of the water bills? We do baby wipe baths in between,” says Walters. 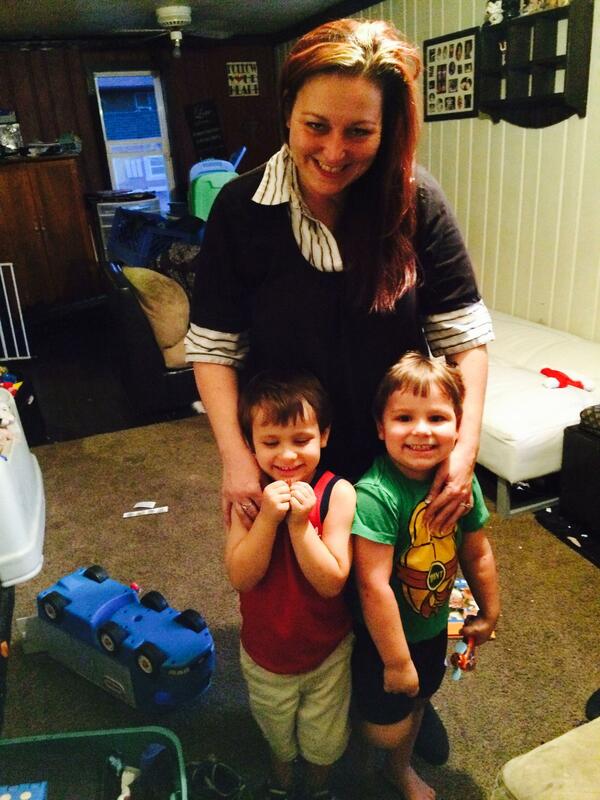 Lee Anne with her twin boys Garrett and Gavin. Note the crates of bottled water by the refrigerator. Walters scrubs the boys down with baby wipes almost every day. Luckily, her husband can shower at work. Her two oldest kids – they're teenagers – usually shower over at grandma’s house outside of town. There’s a lot of people in Flint who knew something was wrong with the water, but this family’s story, particularly Walters' role as a worried mother, changed everything about how the water crisis in Flint was handled. People in Flint started complaining about their tap water early in the summer of 2014 – not long after the city stopped pumping its drinking water from Detroit. Instead, Flint started pumping it from the Flint River. Back then, Lee Anne Walters didn’t think it was that big of a deal. They had just bought their house. Someone had stripped all the plumbing from it, so they had to redo the house with new plumbing, and they installed a whole house filter. Every drop of water that comes into her home goes through this filter. But a few weeks after the city’s switch to water from the Flint River, Walters noticed something was weird. Lee Anne Walters in her swimming pool. She had just set up the swimming pool in the side yard for the summer. 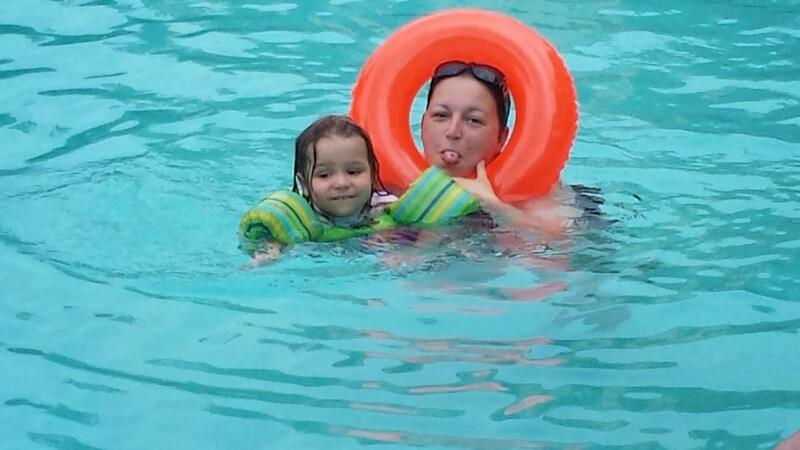 “Gavin started breaking out every time he’d get in the pool,” says Walters. The rash was bad enough that Walters took him to the doctor. Later, Walters says her doctors suggested it was eczema. They gave her a cortisone cream to rub on Gavin’s rash, but by July 2014, it wasn’t just Gavin. His twin brother Garrett got the rash too. “And we took them in and they told us it was scabies, so we treated them with a pesticide,” says Walters. Tiny mites cause scabies, and the common treatment is a chemical that’s also in some pesticides. It’s even in some mosquito nets and flea collars. 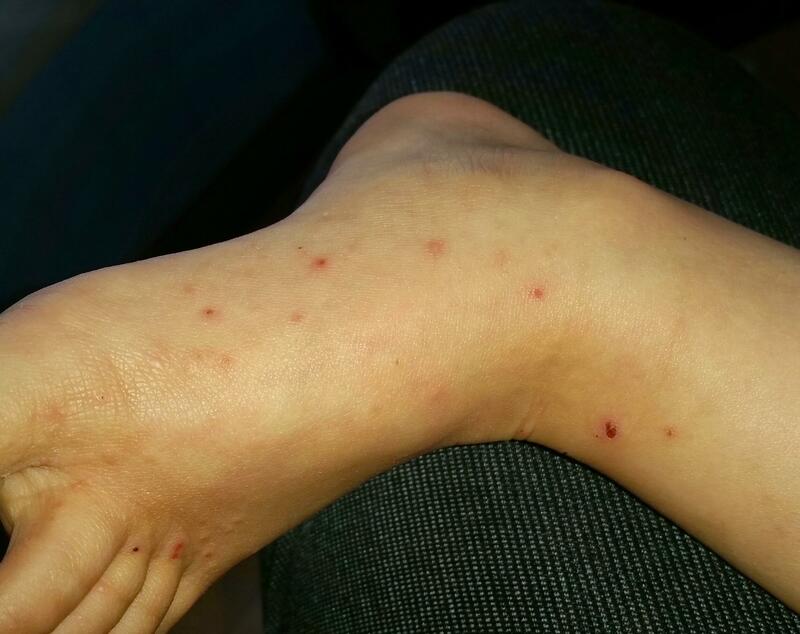 The rash on four-year-old Gavin Walters' foot. Walters rubbed the prescription cream on her twin boys from the neck down. “I spent a ton of money because all the laundry that we had, all the bedding that we had, we took it to a laundromat,” she says. Walters was relieved when the boys’ rash went away, but that feeling didn’t last long. Walters remembers the day the rash came back, because she had a bunch of people over to celebrate her daughter’s high school graduation. "... all the people that were here swimming and drinking the water, all of them broke out." “And all the people that were here swimming and drinking the water, all of them broke out,” she says. She scheduled another doctor's appointment for her four-year-olds. She got the same diagnosis, but Walters really had some doubts about the scabies diagnosis, especially after the party. Walters wasn’t standing for it anymore, so she took Gavin to a dermatologist down in Brighton. They scraped in between Gavin’s little toes, and put it under the microscope. “And she verified by doing the skin scrapes that there was no scabies. There was no live anything – no dead anything – no eggs, so no scabies,” she says. She still didn’t know what caused the rash, but Walters noticed something. Gavin’s rash flared up every time he swam in the pool, and every time he took a bath. It became clear to her right then that Gavin’s rash was caused by something in the tap water. Eight months after Flint started pumping its drinking water from the Flint River, Lee Anne Walters stopped letting her kids drink it – everyone from the four-year-old twins, Garrett and Gavin – to her teenagers, JD and Kaylie. 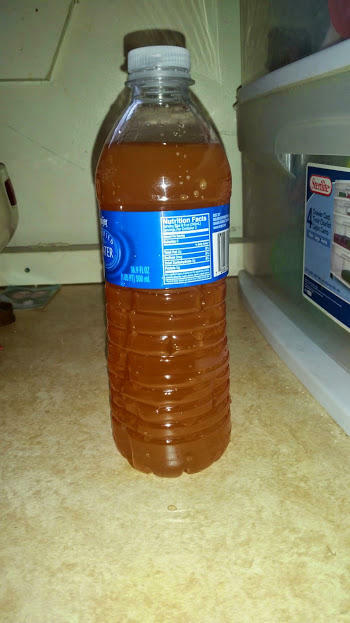 “We quit drinking the water in December, when my 14-year-old got sick and it started coming through our filter and out the kitchen sink brown,” she says. A sample of the water coming out of Lee Anne Walters' tap. Walters says the water had this orangeish-brown tinge that would not go away, even when she put a fresh cartridge in the water filter, and at this point she was putting a fresh cartridge in the water filter at least a couple times a month. Back when Flint was buying Detroit water, she only replaced it a couple times a year, so she called the city out to come take a look. The city sent Mike Glasgow, Flint’s Utilities Administrator. He’s a Flint native and he’s spent the bulk of his career working for the city. Glasgow says complaints like Walters’ were common around this time, but there’s a reason this one stood out. “After the first day there, I said, ‘well, there’s a few ways we go about cleaning this up. We can flush hydrants. I’ll have people from our service center get out and check the area – see if anything’s out of the ordinary. I’ll be back a week later as a follow-up and usually we can clear something up in that amount of time,’” he said. A week later, Glasgow went back to Walters’ house. Her tap water looked exactly the same. It still had this orange tinge. “And I just happened to have some lead and copper sample bottles with me, and since her water was still discolored, I started to worry more about corrosion,” he says. People like Glasgow, those who help operate water plants in older cities like Flint, they worry about corrosion. It can be a sign that a city isn’t treating its water properly. Water that’s treated correctly – that has the right chemical balance – it will actually coat the inside of old pipes. That coating helps keep metals, like lead, copper, and iron from showing up in people’s tap water. An urgent voicemail. A mother’s panic. Glasgow ran a test on Walters’ water. “About a week later I got the results and it was pretty high for lead, so I called her right away to let her know,” say Glasgow. The results were alarming enough that Glasgow called Walters right away, but he couldn’t reach her that afternoon. He left her a voicemail. Walters vividly remembers the message. Walters tossed and turned all night, worrying. How bad could the water be? By the time Walters did get ahold of Mike Glasgow the next day, she was kind of panicked. I just want to make sure you really get these numbers they’re talking about. I mean, there’s no level of lead exposure that is considered safe, but any amount of lead in water above 15 parts per billion is a problem. At that level, cities are supposed to at least warn you about how bad your lead levels are. The lead level in the water at the Walters’ place was seven times higher than that. But at that moment, hearing that number – 104 parts per billion – Walters remembers she didn’t know what to make of it. Glasgow was adamant no one drink the water. Don't use it to cook with. Don't brush your teeth with it. Glasgow was adamant no one drink the water. Don’t use it to cook with. Don’t brush your teeth with it. If you’re going to take a shower, wash dishes, or even do a load of laundry, let the water run for 10 or 15 minutes first. Flushing beforehand helps lower lead levels, he said. A week later, Glasgow came back to do a follow-up test. “And that one came back at 397, and it was like, ‘whoa. OK. Well, here's an even higher number. What the hell?’ And then it was, ‘OK, well now you've got to start flushing your water for 25 minutes before you use it for anything,” says Glasgow. After that test, Glasgow decided to keep a close eye on the water at the Walters’ place. He came out almost every week. You can see iron in water. It’s what gave Walters’ tap water that awful orange tinge, but you can’t see the lead in water. It’s odorless, tasteless, and much more dangerous to your health. 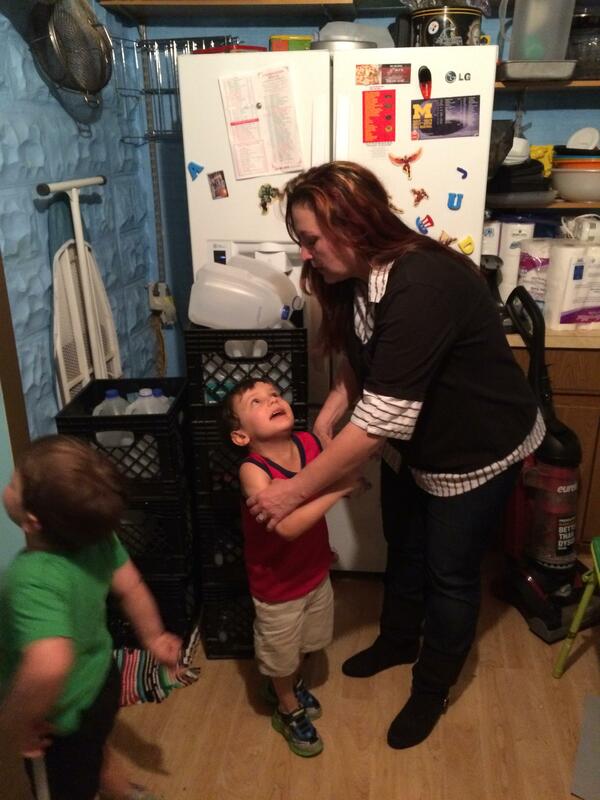 When she tested her kids for lead, one of her twin four-year-olds, Gavin, had lead poisoning. With numbers like that, Lee Anne Walters did what probably any mother would do. She took her kids to the doctor to get tested for lead. When the tests came back, the diagnosis wasn’t good for Gavin. The doctors said he had lead poisoning. Click here to listen to part two of our series, where we’ll hear how Lee Anne Walters contacts the EPA, and red flags start to go up. Mike Glasgow’s fear about corrosion turns out to be well founded. Flint’s water crisis is now the subject of a federal lawsuit. The lawsuit filed on behalf of four families was filed Friday. The lawsuit singles out 14 state and local officials FOR “reckless” conduct connected to the decision to switch to and stay with the Flint River for the city’s drinking water source. The lawsuit names Gov. Rick Snyder, former Flint Mayor Dayne Walling and former emergency manager Darnell Earley, among others.